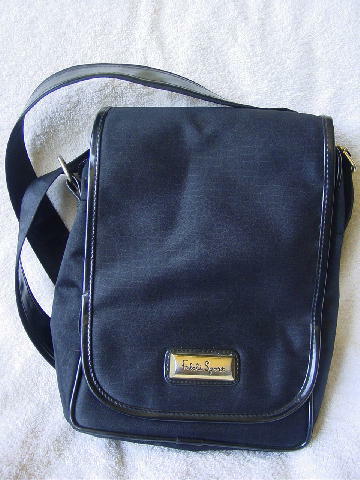 This black fabric purse has a long front flap with a hidden magnetic closure. On the outer side is an elevated somewhat tarnished bar with Falchi Sport etched on the center. The top under the flap has a side to side zipper with a plastic lining and a black cord and gold-tone safety hook for your keys. 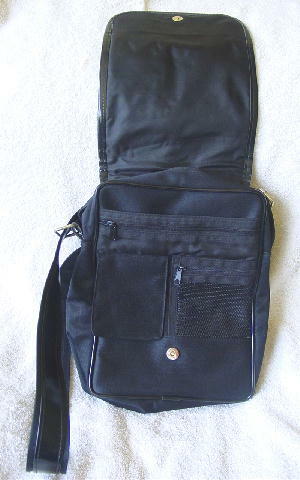 The back exterior has a large open compartment and the front has a back open pocket with velcro closing a large zippered compartment, 3 credit card slots under the velcro flap, and to its right a net see-through pocket. It has a 44" long by 1 1/2" wide adjustable shoulder strap /two handles.